Who said you can't make a style statement with an off-duty outfit? 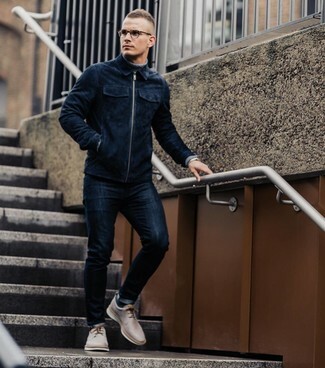 Turn every head around in a navy suede bomber jacket and J Brand Mick Skinny Fit Jeans from Nordstrom. 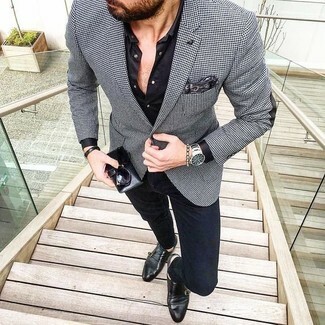 Elevate this look with a pair of beige leather derby shoes. 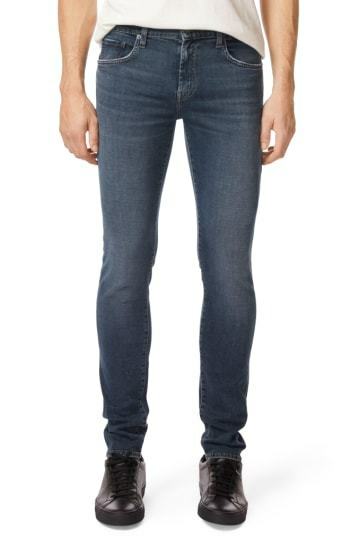 If you're scouting for a casual yet seriously stylish ensemble, rock a grey v-neck sweater with J Brand mick skinny fit jeans. Both pieces are totally comfortable and will look great together. When it comes to footwear, this getup is complemented nicely with navy suede low top sneakers. If you're hunting for a casual yet sharp outfit, pair a black and white houndstooth blazer with J Brand mick skinny fit jeans. Both items are totally comfortable and will look great together. Got bored with this look? Enter black leather double monks to change things up a bit. If you're after a casual yet stylish look, choose a brown plaid wool blazer and J Brand mick skinny fit jeans. Both items are totally comfortable and will look great paired together. You could perhaps get a little creative when it comes to footwear and dress up your ensemble with dark brown leather loafers. 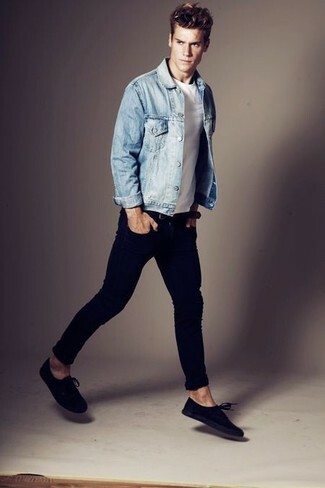 If you're searching for a casual yet dapper look, consider wearing a light blue denim jacket and navy skinny jeans. Both items are totally comfortable and will look great together. Round off with navy low top sneakers and off you go looking dashing. 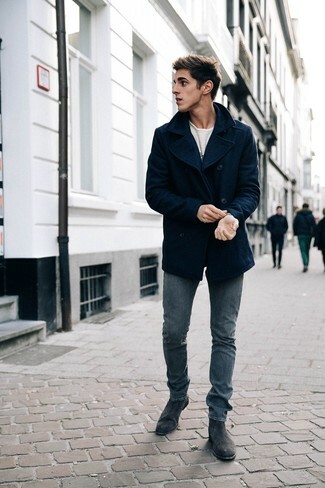 If you're on a mission for a casual yet dapper look, wear a navy pea coat with navy skinny jeans. As well as totally comfy, both items look great together. Channel your inner Ryan Gosling and grab a pair of black suede chelsea boots to class up your getup. 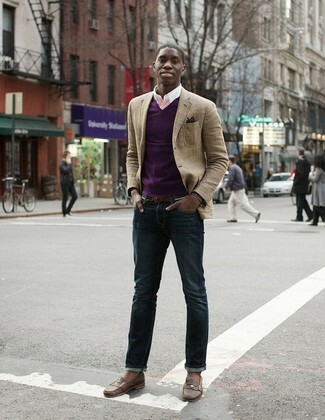 If you're on the lookout for a casual yet on-trend look, go for a grey blazer and J Brand mick skinny fit jeans. Both items are totally comfortable and will look great together. Bump up the cool of your ensemble by completing it with brown leather casual boots. 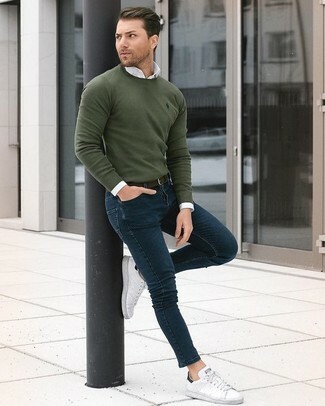 If you're hunting for a casual yet sharp getup, consider pairing an olive crew-neck sweater with J Brand mick skinny fit jeans from Nordstrom. Both pieces are totally comfortable and will look great paired together. When it comes to footwear, this ensemble is complemented nicely with white leather low top sneakers. 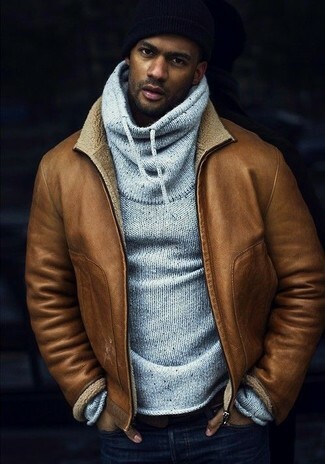 If you're looking for a casual yet on-trend look, go for a tan shearling jacket and J Brand mick skinny fit jeans. Both items are totally comfortable and will look great paired together.